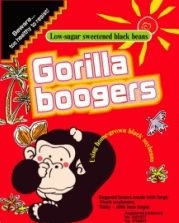 One of my favorite blogs, Neatorama, put up a link to a interesting internet find… a Japanese snack called Gorilla Boogers. Leave it to the Japanese to integrate ‘Engrish’, primates, and amazing marketing tactics. 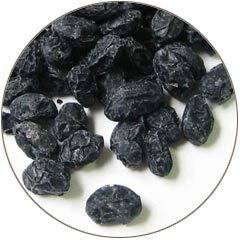 “a bunch of raisin-like black beans, I think, but they’re marketed as those funk-nasty snot rockets that caged gorillas like to shoot at spectators at the zoo. I was in Japan at the time the Mainichi Daily News article was published, specifically November 2002 and I didn’t see this delicacy anywhere. I woulda surely picked up a batch! Are there any Primatology.org readers out there who have tried Gorilla Boogers? If so, please share with us your experiences… I’m dying to know exactly what they taste like. Wow, have you seen what they look like? Betsy, they look so unappetizing. Did you check out the grapevine of blog posts about it? I guess they will be making it to the U.S. and you were right they are a great item to sell at zoos! Yes, I have seen some of the blog posts about it and I’m having a hard time believing that they are as tasty as everyone claims. I’ll make you a deal… if I can find some, I’ll buy them… but you have to try them first.